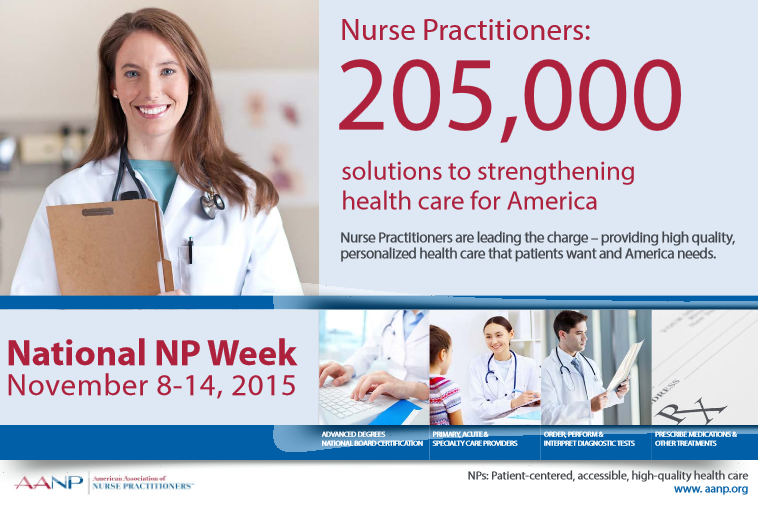 National NP Week is a great time to recognize some of our favorite healthcare professionals-- nurse practitioners! Celebrated November 13-19, 2016, National NP Week acknowledges the more than 222,000 practicing NPs in the U.S. in addition to the 20,000 new NPs finishing up their studies and entering the workforce. Further, it aims to remind "lawmakers of the importance of removing outdated barriers to practice so that NPs will be allowed to practice to the full extent of their experience and education." Did you know that this year marks the 50th anniversary of the first nurse practitioner (NP) program? Or that today there are more than 200,000 licensed NPs in the United States? With so much to celebrate, join us in recognizing the importance of National Nurse Practitioner Week to raise awareness for all those who deliver patient-centered, accessible, and high-quality health care to millions nationwide. Join us in celebrating all the talented, compassionate, and highly skilled nurse practitioners (NPs) across the country because it's National NP Week!